We recently asked Dr. Guttuso to give us his background on HG and why he became interested in the cause. But first, here is what he told us about the new research study. Dr. Guttuso, a neurologist, also wrote to explain his interest in HG to our community. 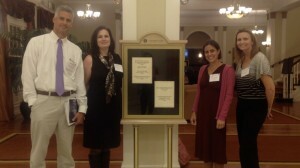 “I am often asked how a neurologist ever became interested in doing research on hyperemesis gravidarum (HG). I received the same question for 14 years when I was performing research on non-hormonal treatments for hot flashes and night sweats well before I ever started my HG research. The simple answer to both of these questions is that the discoveries happened by accident by just listening to my patients. The medication for both of these conditions is gabapentin (Neurontin). Back in 1997, when I was a neurology resident at the University of Rochester, I prescribed gabapentin for a woman with migraine headaches. One week later she called me to tell me that she loved the gabapentin because all of her hot flashes and night sweats resolved and she was “sleeping like a baby again”. I found this to be very interesting and, over the next 14 years, kept at this research and performed several large studies showing that, indeed, gabapentin was effective for treating hot flashes. In about 2000, another woman contacted me to tell me that she thought that gabapentin was helping to prevent the nausea and vomiting she had been experiencing from the chemotherapy she was receiving for breast cancer. Due to all of the research I had already performed on gabapentin’s mechanism of action for treating hot flashes, I immediately thought that it was logical that gabapentin could also help with nausea and vomiting. I then performed a small study among 10 women receiving chemotherapy that showed very promising results supporting gabapentin’s use for chemotherapy-induced nausea and vomiting. This was when I first had the idea that perhaps gabapentin could also help women with HG; however, at that time there was very little published on gabapentin’s safety for use in pregnancy. It wasn’t until 2008 that there was enough data published on gabapentin’s safety that I was able to start a small study among 10 women with HG. I’ll never forget the very first woman who enrolled in our study. She was admitted to the hospital with horrible HG, had lost about 15 pounds from her pre-pregnancy weight, couldn’t keep down any water or any kind of food and was so disabled from her HG that she was scheduled to terminate her pregnancy the following day. When I first met her, she could barely even talk to me being so weak and exhausted. She told me about her last pregnancy during which she had HG just as bad as her current pregnancy and was recommended by her doctors to terminate because her health was critically compromised. This woman looked like she was fighting a war that she knew she was going to lose. She had tried multiple different medications and nothing was helping her. She also told me that some of her doctors told her that she had anxiety or depression and completely discounted her HG. She was helpless and hopeless. I had her take her first gabapentin pill with a tiny sip of water right after she had an episode of retching. She was able to keep it down and so I left and told her I’d be back later to check on her. When I returned 2 hours later I couldn’t believe my eyes and ears. She was sitting up in bed, all of her color had returned to her face and she was smiling. In a cheerful voice she said, “Hi Dr. Guttuso, I think the pill is already working. Look!”. She showed me her lunch tray from which she had drank all of the milk and even eaten some of the food. It was right then that I knew I needed to keep at this research until I could someday get to the point where I could do a large study, just like I was able to do with hot flashes, but this time with HG patients taking gabapentin. And now 6 years later, I’ve been given that opportunity. 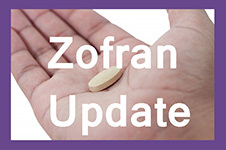 We have been funded by the National Institutes of Health to conduct a clinical trial comparing the effectiveness of gabapentin to ondansetron (Zofran) among 80 women with HG. We will be enrolling at the University of Buffalo and the University at Rochester. It should take about 3-4 years to complete this study. When completed, we will have an answer as to whether gabapentin is significantly more effective than ondansetron, which is currently considered the most effective treatment for HG.